Since June '14 I've been working on Content at Oculus, a division of Facebook, most recently as VP of Content. There are two things I love about my job. First, I get to work on cutting edge technology and games with the Oculus team. When Console's switched from 2D to 3D there was a huge learning curve. How would Character Action games work in 3D? I was lucky enough to be able to solve that problem, and although it was hard work, with lots of missteps and frustration, it was some of the most rewarding times in my life. Likewise, the move to Touch and Social has been a huge learning curve that some teams figured out, and many didn't. The VR step from "through a window" to "inside the world" is even bigger. There are going to be a lot of teams that just can't figure it out... and a lot of opportunities for those that do. Second, I have the pleasure of working with some of the best video game development teams in the business (and some great 360 filmmakers as well!). That list includes both teams that I have been lucky enough to work with in the past (like Insomniac, Gunfire, 4A, RAD, and more) as well as new teams that I had never met before (Like High Voltage, OZWE, Crytek Germany, and more). Some of those teams are represented in the 2015 E3 video I've attached above. If you haven't tried the VR yet, you really need to. After working for a year with a top 5 Private Equity group looking at acquisition targets in the Video Game industry it became obvious that THQ, by then too small for a PE group of this size, was in dire straits. Centerview, the Investment Bank that we were working with, approached Brian Farrell, THQ's CEO, and an emergency turnaround program was launched with Jason Kay and I placed in the roles of Chief Strategy Officer and President of THQI respectively. Mysterious Ways is the second comic series that I created and wrote. Mysterious Ways asks a simple question: If god does indeed work mysteriously, then how can we know good from evil? Though a search will turn up thousands of people a day parroting this phrase on Twitter alone I am not sure that a single one of them have stopped to think about the ramifications of these easily spoken words. Fundamentally, everything we believe about good, evil, truth, and justice rely on the fact that there is absolutely nothing mysterious about these principles. I co-founded Monkey Gods in 2009 with Jason Kay and Andy Gavin to explore Mobile and Social Games. We first licensed Snood, one of the most popular download games of all times, and re-envisioned it for iPhone and Social. It launched in the top 20 in the iPhone app store. Next we created Monkwerks for Facebook, an incredibly fun and addictive multi-player wordplay game that had a large fanbase and tons of repeat usage. I tested it with the girl I was dating at the time and we had such a good time that I asked her to be my wife. I had a lot of fun working with Andy and a small team on casual games, and it brought back memories of making games in the mid '80's. But ultimately we decided that casual wasn't the space for us and we took Monkwerks off line. You can play Snood here! 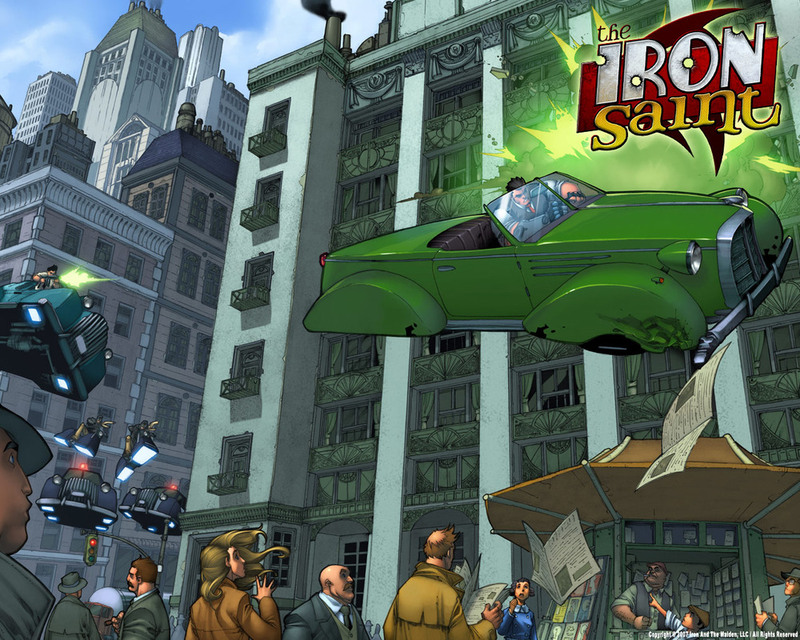 The Iron Saint was the first comic book series I created and wrote. I started in mid 2005 and had written the six books by early 2006. I then set out to find the best artists I could find to bring it to life. I had an incredible time creating this series, which took over 3 years from first draft to TPB. What was Flektor? It's a good question, and one I am frequently asked. Back in the day, circa 2007, there was a Social Media site called MySpace. Ask your mother, she probably remembers. Myspace was a mess, and one of the worst aspects of it was that you had to know how to code to make your site look good. Smart phones weren't a thing yet. And there was just about nothing available that helped you edit movies, make slideshows, let alone create surveys, make titles, etc. That's where Flektor came in. Flektor took all of your photos, video, and other media and let you create live movies in your Browser. If you had a sequence of photos, for example, you could add to it by emailing a photo from your dumb-phone at the bar. It would add itself to the slideshow everywhere that movie was embedded. Remember, we were in a pre-smartphone, pre-app world. So this was seen as magic. If your friend told you she didn't like one of the photos, you could remove it and it would disappear from the movie even if someone was already watching it! And because the files were live, we could add a survey to the middle of a movie, or branch to different sections with a selection screen. So you could create a chose your own adventure with a little work. Even the transitions, like wipes and fades were live, and were applied real time. You could add a webcam stream that would go live, or replace an entire movie at the touch of a button. And multiple people could edit the stream at the same time. We showed this off by turning a movie on my MySpace page suddenly turn into a live broadcast at one presentation. And, the files could be easily placed in your MySpace profile. People loved it, and they loved our sample content. We had tens of millions of views on the content we created and edited on Flektor ourselves. Tens of millions was a truckload at the time. Basically we built a product meant for 2015 almost a decade too early, releasing it to the public in 2007. The demo was so good that just about every media company at the time made an offer. But MySpace made the most compelling offer, and with Facebook just a blip on the horizon we sold the company and started working on integrating it into the site. Six months later Facebook passed MySpace and shortly thereafter it died. Yes, we hired the Workaholics guys when they were stone cold broke and before they were the Workaholics guys. They were hilarious then too, and clearly destined for success. Unfortunately, what you see above is all that is left of Flektor. You'll just have to take my word for all of this. After finishing the first four Crash titles, and with the launch of the PlayStation2 the Naughty Dogs were ready to tackle a new character and new universe. Almost 3 years of development went into the first Jak and Daxter title, launched in 2001, and another three years saw the release of the second and third titles. The series went on to sell over 12 million copies, and was re-released as an updated trilogy for the PlayStation 3. The second Jak title is one of the games I am most proud of. Some of the ideas the team had for combining story and game seamlessly were just a little out of our reach on the PS3. But Naughty Dog fulfilled those dreams on Uncharted shortly after I left. I co-created Crash Bandicoot in 1994 while I was working at Naughty Dog, the company I co-founded in 1985 with Andy Gavin. These titles sold over 40 million copies on the first PlayStation console and Crash was the highest selling Franchise of that generation of console. Somewhere around 5% of all Playstation software sales were a Crash titles, including 2 of the top 5 titles and 3 of the top 10. For many years after its release, Crash Bandicoot: Warped was the most successful foreign title to have ever been released in Japan. Crash sold Pizza Hut pizza in America (launching Stuffed Crust), was on the side of the TGV for a summer, instructed Australian schoolkids in swimming safety, and created a minor dance craze in Japan. It's impossible to encapsulate in words what it was like to start a company with Andy Gavin at 15 years old, create the #1 Video game on the planet a decade later, and then watch the team go on to create the Game of the year in 2013. But this video, created by Naughty Dog and Sony for the 30th anniversary of Naughty Dog comes pretty damn close. I can't possibly do justice to all of the Naughty Dogs by naming them here, but from the first 8 person team to the 100 some odd that were there when I "retired" the Naughty Dog's were always the hardest working, most talented group of people I have had the honor to work with. AAA video games are the creation of larger and larger teams, but no matter how big they get, the input of every member of the team is instrumental. If one area is weak, the whole is weak. Naughty Dog is great at making sure that absolutely everything is of the highest quality. There are a huge number of external people that were instrumental in Naughty Dog's, and by extension my success. Chief among them would be Trip Hawkins, who identified the potential talent in two geeky 17 year olds and gave us a shot making games for Electronic Artists, Skip Paul, who brought us to Universal Studios and gave us the space and backing to create Crash, Mark Cerny, who was always the "n+1'th" Naughty Dog and taught me that game design is as much science as art, Shuhei Yoshida, our first and greatest producer and Godfather of Naughty Dog, Kaz Hirai, who accepted Naughty Dog's unique culture at the acquisition and preserved it thereafter, and of course Sony's international team of Management, Producers, Marketeers, Salespeople, and other staff. I've lived a very lucky life, and I know that I owe that to the Naughty Dog's, the people I listed above, many more that I have inadvertently missed, and of course those that have played my games. Once a Naughty Dog, always a Naughty Dog. Video Courtesy of Sony Computer Entertainment.